The 2001 best seller, Good to Great (Jim Collins), is an important modern business book about how companies become great. Collins examined 1435 firms, but focused on 11 from different industries that went from good to great based on stock price improvement with sustainability for at least 15 years. To help understand why these companies were so successful, Collins compared each to a similar, but less successful, competitor in the same industry. Stay with me here- we are getting to the point about hiring! Collins found that the great companies had CEO/leaders with a blend of humility and professionalism, and a strong desire to build a great company. These CEOs tended to be modest and understated, as opposed to CEOs at their competitors who had less humility and big egos. CEO humility, it turned out, helps to build trust and allows employees to contribute without fear. As a manager, humility is a good trait to have. But the other major finding, more pertinent to this blog, was that leaders who took their companies from good to great focused first and foremost on placing the right people into the right jobs. Lacking that, all other efforts are futile. Therefore, arguably your most important duty as a manager, and before you do anything else, is to hire exceptional people into the right positions- or find them internally. Collins concluded that with the right people in the right positions, other challenges, such as managing and motivating employees, require little effort. The right people can change direction more easily and are motivated by their inner drive to produce superior results. People are not your most important asset- the right people are! So look for character, basic intelligence and work ethic- in addition to the specific knowledge and work experience required to get the job done. As the department manager, putting the right people into the right jobs is your most important responsibility. Ignore it and your department will always be mediocre. To succeed, you must hire top-quality people into key positions; conversely, anyone who is not right for a position should be replaced. Based on my experience, most managers do not devote the necessary time and energy to the hiring process. But now that you understand why proper hiring is so important, you can take this process very seriously. When you hire someone you are adding a spoke to your department wheel, and a weak spoke will drag down the entire department. It makes no sense for you to plan and coordinate departmental work if you do not have the right people in place to get the job done. So take the time to get the right people on the bus and into the right seat. Do not be penny wise and pound foolish when hiring. Be willing to invest enough money and effort to get the level of talent the position deserves. Set the pay scale high enough to attract the best qualified people. Your job is not to be best at the technical or professional work being performed in your department; it is to hire the best people possible. They, not you, will be doing the work. If they are good, you will look very good. And the better they are, the more you can sit back, watch productivity grow, and feel great. I’m won’t spend time here on how to plan and implement the hiring process. That is covered in depth in my book, Managing for Success: Practical Advice for Managers, available at Amazon. In his book “The Human Side of Enterprise,” Douglas McGregor explained that our experiences, assumptions and beliefs define how we think and react to events, and thus our management style. He defined two opposing sets of managerial beliefs and behaviors and called them Theory X and Theory Y. Theory X managers assume employees dislike work, avoid responsibility, do only the minimum required, can’t be trusted, and have little desire to solve problems or advance within the organization. With these negative assumptions and beliefs, Theory X managers think they must micromanage everyone, tell them what to do and how to do it, and yell a lot. Is Theory X manager is a very unpleasant person to work for. Theory Y managers, on the other hand, assume the opposite. They believe most employees want to learn, do a good job, use their talents, accept responsibility, manage their own work, control their own fate, solve problems, make decisions, achieve positive results, be recognized for their good work, and grow within the organization. If you have a Theory Y boss who respects you and your work, you are quite lucky. And you most likely enjoy your job. So which boss are you, Theory X or Theory Y? What you believe and practice will determine the results you get. Your management style becomes a self-fulfilling prophecy. If you practice Theory X, as many managers still do, you are creating unhappy, unmotivated employees who are giving you mediocre results. Most likely turnover is high. Your department could be so much better and much more productive. But if you practice Theory Y, most likely your people are happy, motivated and productive. This is especially true if you 1) give them meaningful and challenging jobs, 2) provide them with opportunities to achieve, 3) recognize them when they achieve and 4) allow them to plan and manage their own work- as long as the quality is high and deadlines are met. Think of your department as a wheel. As manager, you are the hub and each employee is a spoke. Your job is to make each spoke as strong as possible. You do this by hiring and developing exceptional people, giving them meaningful and challenging jobs, providing the necessary training and education to do the job well, helping them set goals, coaching them when needed, monitoring goals and performance, and making adjustments as necessary. Think about it. With you, a Theory Y manager as the hub, you can maximize the effort and output of each person in your department and each spoke will be strong. If you build a strong team who support one another and departmental goals, everyone will be moving in the same direction. Then you can’t help but have a successful department. Consequently, you will be perceived as a successful manager. By delegating and focusing on everyone else, you are helping yourself. Develop your team and you will benefit as much as they do—probably even more. In my last article I wrote that your real job as manager/supervisor is to get your departmental work done through others, not to do it yourself. You have other, managerial, work to do. Delegation is a critical management skill and the unwillingness or inability to delegate is a leading cause of management failure. By delegating meaningful assignments to workers capable of doing it, you will be developing their skills and freeing up time for you to do your managerial duties. technical aspects of the work, and to delegate properly by explaining the assignment comprehensively: what is to be done, why it is important, and what the results should look like (your expectations). Furthermore, your technical background enables you to effectively coach throughout the assignment if you are asked for help. HOWEVER, a strong technical or professional background is a disadvantage if you continue to do the work yourself, if you micromanage after delegating an assignment, or if you insist on having things done only your way. Just because you are capable of doing the work is not an excuse for doing it yourself. Unfortunately, many poor managers don’t understand this. If you are personally involved in any workflow, be sure to act quickly. If you delay any decisions or any part of the work process, you become the bottleneck. I once had a boss who had to review and approve every market research study proposal. He sat on them so long that, by the time he decided to approve the study, it was almost to late to do the work. Delegate anything that is challenging, meaningful, adds responsibility to an employee’s job, or can help develop his or her skills. Try not to do any meaningful work or assignment yourself if someone else in your department can do it, unless it is confidential or intended exclusively for managers. By delegating meaningful work you make the employee’s job more challenging, reduce frustration, resentment or boredom, increase job satisfaction, and help build self-esteem. Using your professional or technical knowledge as an advantage, clearly define the assignment, goals, deadlines, and your expectations. Explain why the work is being assigned and why it is important to the company or the customer. Ask how the employee feels about the assignment and discuss whether any new training is needed. Then ask for a commitment. People are more likely to commit to an assignment if they understand its importance and believe in it. Moreover, if they fully understand the assignment, they can be more creative in their approach to getting the work done. Once you delegate a project, get out of the way. Make yourself available as a coach and consultant, but avoid micromanaging, which can disrupt the process and cause employee frustration. Do not pull up the roots just to see how things are growing. After you delegate and explain a major assignment, wait a few days and then ask the employee how things are progressing. Ask if any questions have come up since the project was assigned, and ask about the project timeline. The answers will tell you how well the employee understood the assignment and if anything needs clarification, and it alerts you to signs of anxiety or confusion that could impede the desired results. Some managerial duties or assignments should not be delegated; you must do them yourself. They include planning, preparing budgets, hiring, enriching jobs, setting goals, conducting performance reviews, staff development and sensitive assignments requested by top management. Also, don’t give an assignment to someone who is not good at or does not like doing that type of work. Doing so will force people to be mediocre. Put people into positions where they enjoy their work and are good at it. In an earlier article I explained that the primary reason managers (and supervisors) fail is because they are not properly trained. Most get promoted into these positions because they have very good technical skills (they know how to do the work), but once promoted they are not trained on the specific skills needed to manage people and departments. And they don’t understand what their real job is. Yes, you are capable of doing the technical or professional work performed in your department. Maybe you can do it better than anyone else (that’s why you were promoted), you like doing the work, and training others is time consuming. So it seems natural to keep doing much of the work yourself. Don’t fall into this trap; doing departmental work is not your job (unless you have a very tiny department). Your real job is to perform the duties only a manager can and should do, and to leave the actual department work to the people hired to do it. Spending your time on non-managerial work means you won’t have time for your managerial duties- your real job. You may even be so busy doing non-managerial work that you perceive questions from your employees as interruptions- something you should never do. But here is the biggest problem of all: if you don’t delegate appropriate work to your employees you stifle their growth and development, minimize their opportunities to achieve and to be motivated, and you lower overall department productivity. As Manager you are judged on the success or failure of your employee’s performance. Measurements such as department productivity depend on everyone’s combined efforts, not yours. Your real job is to nurture and coach employees so they excel individually; your success comes from their collective accomplishments. Because your success is so closely tied to theirs, you should do everything in your power to help them succeed. Think of your department as a wheel: you are the hub and each employee is a spoke. Your real job is to make each spoke as strong as possible. You do this by hiring the right people for each position, designing meaningful, challenging jobs that provide opportunities to achieve, providing necessary training and education, helping individuals set goals, coaching as needed, monitoring performance, and making adjustments as necessary. Think about it. If you maximize the effort and output of each person in your department, each spoke in the wheel will be strong. If you build a strong team with support for one another and for departmental goals, everyone will be moving in the same direction. With a successful department you will be perceived as a successful manager. By focusing on everyone else, you are helping yourself. You will benefit as much as they do—perhaps even more. Conversely, if your department wheel has weak spokes, it does not matter how hard people work. Your department will always be mediocre. Weak spokes will consume much of your time, perform poorly, require careful watching and inevitably someone must clean up their mistakes. Furthermore, tolerating weak employees is unfair to your strong employees. Poor workers cost you time and money while they are on the job and while you spend valuable time replacing them. So remember, your real job is to nurture, develop and coach your employees, and to get the work done through them- not to do it yourself. Beyond that your real job is to perform duties only a manager can do. In the next article we will discuss delegation, a key skill of great managers. Results from recent surveys on employee satisfaction and motivation show that poor management is a continuing problem. The result is low employee satisfaction and more employee turnover. This becomes very expensive when you consider the time and cost of screening, hiring, and training replacements, as well as the loss of productivity while the new hire is being trained. After observing managers for 42 years at 15 companies, the reason so many managers fail is clear: they were not trained to manage. Most managers are promoted into supervisory positions because of their technical or professional abilities, not because of their managerial competence or skills. Very few people understand that effective management skills consist of an entirely separate set of skills from those required to succeed in a professional position. Over the years I kept running into managers competent in their profession, who somehow believed they had the knowledge and skills to manage people and departments without any management training. This belief is common, but it makes no sense. Having technical skills does not make you a manager. If your supervisor appointed you to the position of company pilot, you would immediately say, “Wait a minute! I don’t know how to fly a plane. I need training!” But when the same person made you department manager, how did you react? Be honest. It did not even occur to you to ask for management training. But to be effective in your role you need that specialized training and education, just as you do to become an engineer, a scientist, or a pilot. Worse yet, many managers had learned bad management habits from past supervisors and colleagues. They managed as they had been managed, and by emulating their peers, they become poor managers themselves. Incompetent management in industry became my number one pet peeve. I’ve seen it everywhere and when I talk to people from different industries, government, and academics, I hear the same complaints about their management. So I decided to write a concise book to help address this huge problem. 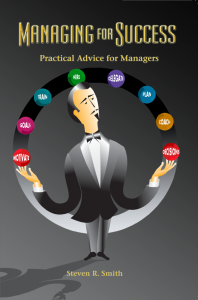 Managing for Success: Practical Advice for Managers is reference guide for daily use by managers of technical, professional, and other white-collar workers. It includes the most useful ideas I have encountered and applied over the years and provides the kind of road-tested advice I wish someone had given me when I was a new manager. Now its time for you to sit back and think about how good you really are. If you are typical of today’s manager, chances are you are not as good as you think, even though you are doing your best. Don’t be afraid to acknowledge that you do not always know what you should be doing as a manager, why you should be doing it, or how to do it most effectively. So make the decision now to go out and get the best management training you can get regardless of how long you have been on the job. Stop winging it. Open your mind to new ideas, learn and apply them. With proper training you too can become a successful manager. You will be happier; so will your employees and your boss.